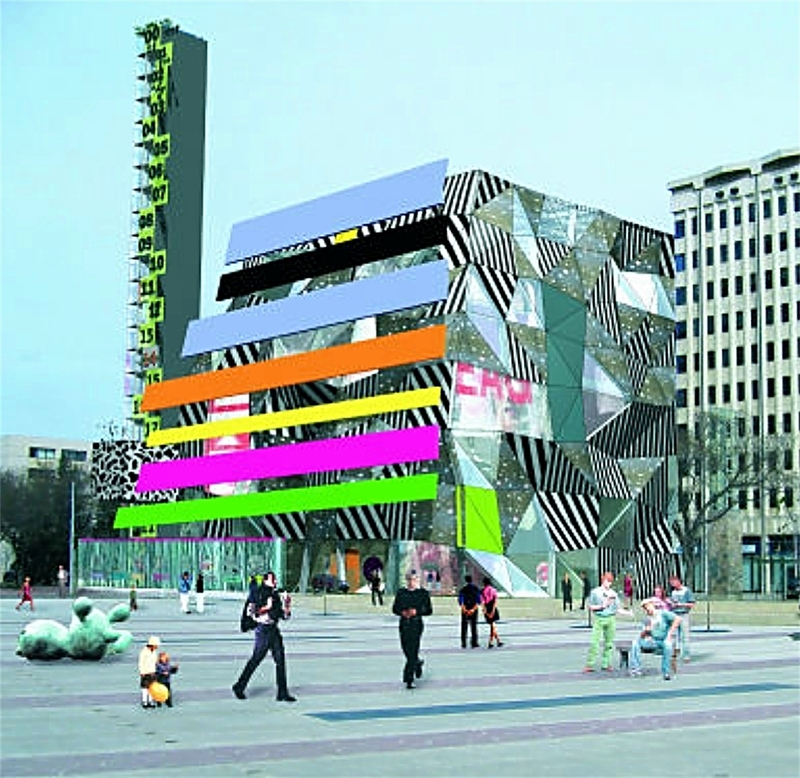 Edmonton Art Gallery design finalist by Alsop Design Ltd. included a boutique hotel tower. I remember the four shortlisted architectural designs for the new building and wishing Will Alsop’s design would win. Ultimately it was Gehry’s contemporary, the late Randall Stout, who won the competition. 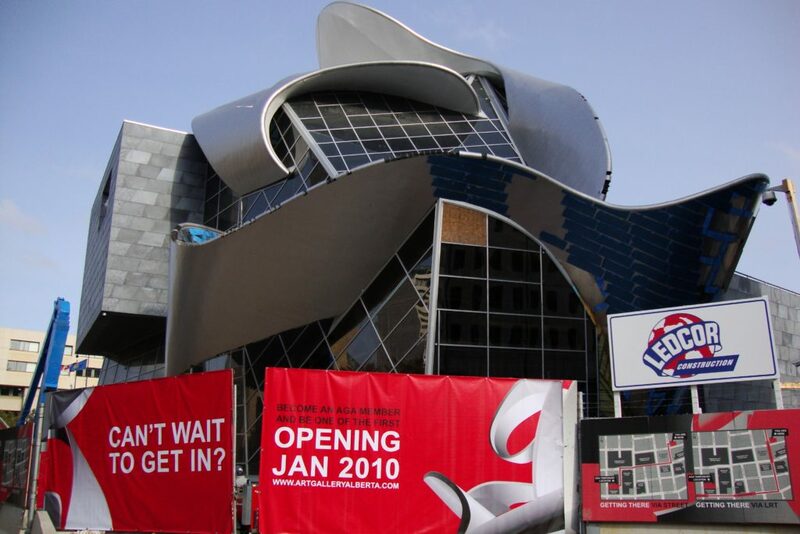 I vividly recall first-year Mayor Stephen Mandel’s great involvement in announcing the winner in October 2005, the promised city funding, and the branding change moving from the Edmonton Art Gallery to the Art Gallery of Alberta (AGA). For Mandel and the organization, it was a great political move to encourage additional provincial funding for the new building, which was enough to put us on the map to attract its partnership with the National Gallery of Canada. A new dawn as the Art Gallery of Alberta construction nears completion in 2008. 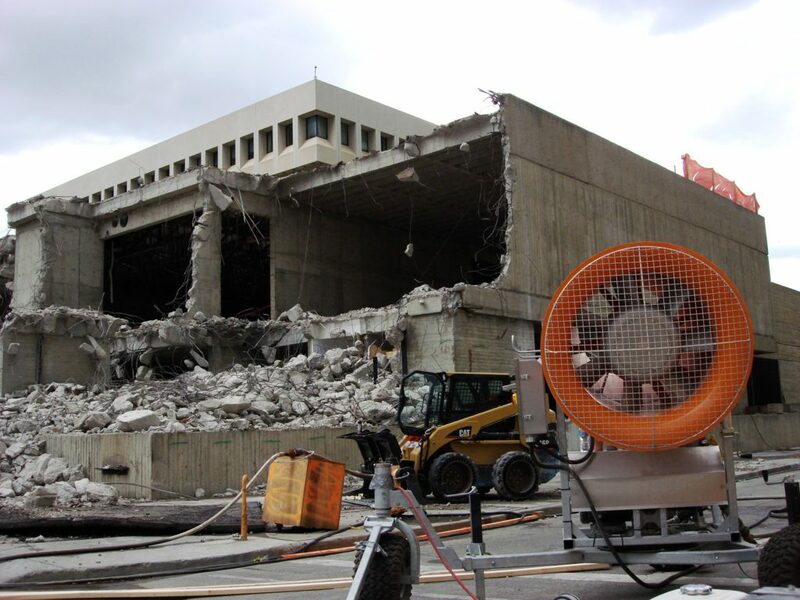 The project to replace our brutalist building was controversial, mainly due to the cost, which was going to be $57 million. And similar to how the North Saskatchewan River motif flows through Stout’s masterpiece, Alberta’s windfall at the time meant building at a time with soaring construction costs. The $88-million postmodern structure would cost nearly twice as much as the $49-million City Hall next to it (inflation not factored). The flamboyant building would also include a visual off-shoot onto the City Hall lot, with a flashy new street access from Churchill LRT station. City Council ultimately voted against the $5-million replacement of this AGA exit onto the northeast corner of Churchill Square, but shortly after, the southwest corner pedway access was quietly replaced without any citizens’ uproar. The cost of this pedway upgrade is currently unavailable. 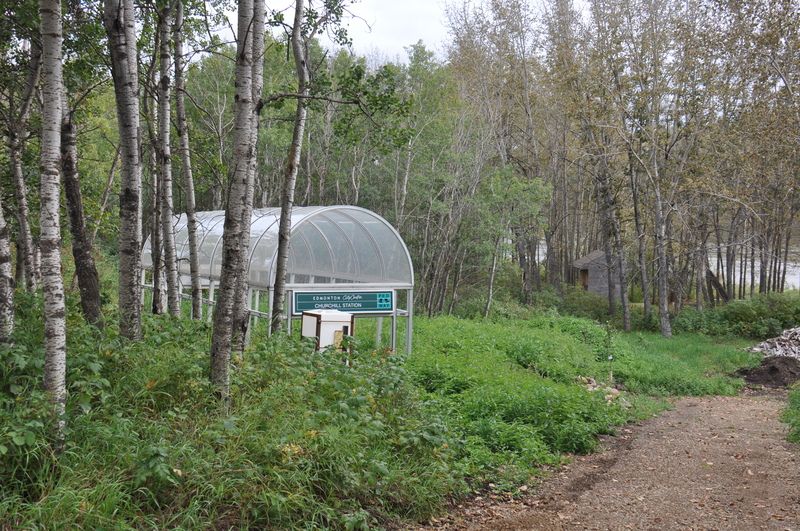 This original Churchill Square exit, which stood proud for the 2005 Royal Visit, was later found 100 km away in Smoky Lake, a settlement which was intended to replace Fort Edmonton (Mark II). Tax dollars accounted for $46-million of the price tag: $21-million from the City of Edmonton (far from the original $6-million contribution), $15-million from the province, and $10-million from the federal government. Before closing the Arthur Blow Condell Memorial Building, the original name of the 1969 modern Edmonton Art Gallery building designed by architect Don Bittorf, the AGA decided to have one final ‘Free-For-All’ exhibit. Local artists brought in more than 1500 original artworks to be displayed in its final show in March 2007 before the wrecking ball swung. 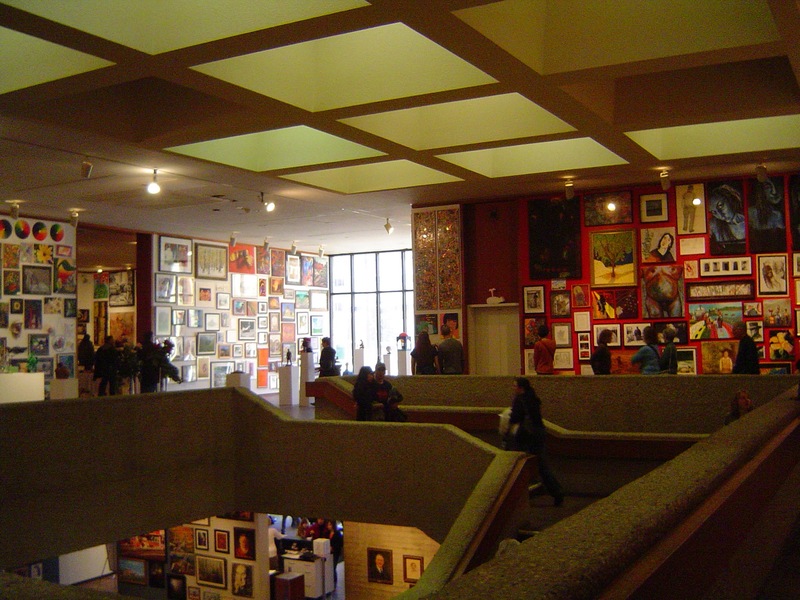 The Free-For-All exhibit featured over 1500 works by the public. The additional costs and minor setback meant an opening delay for the AGA. Although officials claim that the building opened on time, the delay was enough for someone to replace this construction barrier with an opening date change. Capital Modern bus tour at Queen Elizabeth Planetarium. During the time of the construction, the AGA moved its galleries to Enterprise Square, an Edmonton heritage building which began as the Hudson’s Bay Company. As it was an architectural endeavour that moved the AGA here to begin with, one of the most popular exhibits during this time was the Capital Modern exhibition which also saw the Edmonton Art Gallery as one of the features. 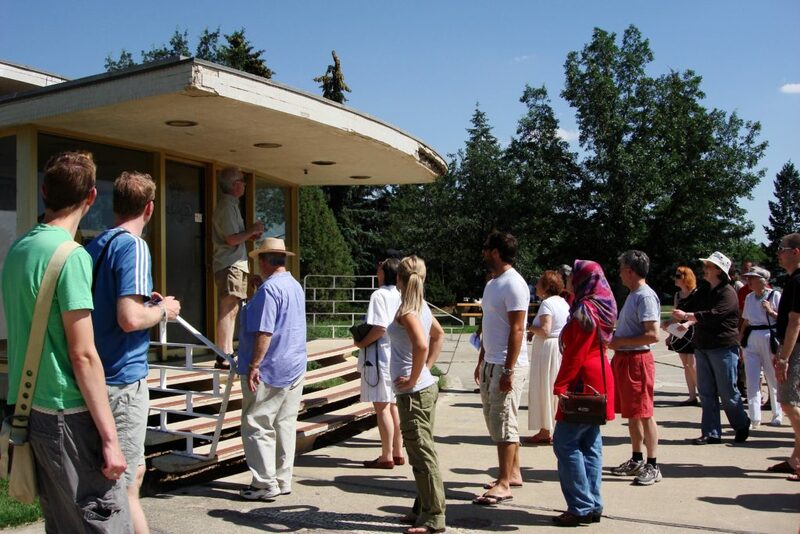 This architecture show was so popular that the AGA even hosted a sold-out Capital Modern bus tour taking patrons around to visit endangered structures from the city’s 1960s brutalist era. In early 2010, the Art Gallery of Alberta opened with a four-day celebration with the first two days for special invited guests and evening gala. 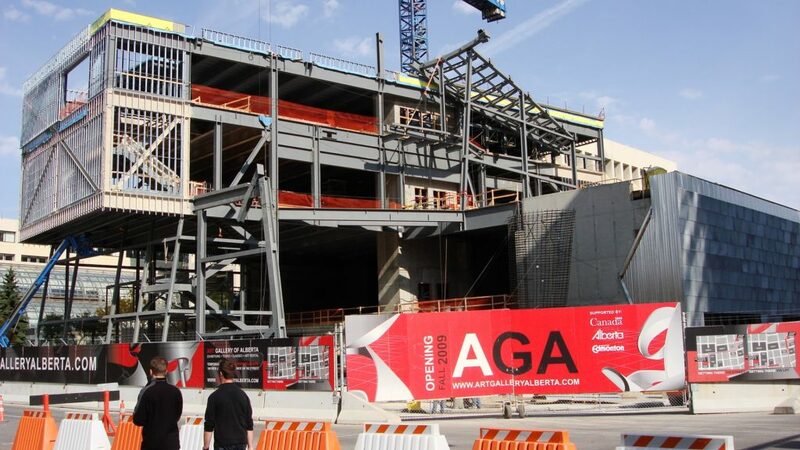 Although the opening ceremonies happened the day before, the official opening date of the new AGA building to the public was Sunday, January 31. There were timed-entry tickets given away for the odd Sunday/Monday public celebratory opening. This Monday carry-over would’ve been much better-suited for Family Day a fortnight later if it wasn’t for the 2010 Winter Olympic Games taking place on Canadian soil. The first two members of the public to enter the brand new building were Catholic religious sisters – Sr. Jeannette Filthaut, S.P. and Sr. Germaine Chalifoux, S.P. The two were among of 12,000 who visited the zinc, glass, and stainless-steel landmark during the opening weekend. Under new Executive Director Gilles Hébert after Tony Luppino stepped down, the opening exhibitions were “EDGAR DEGAS: Figures in Motion,” “KARSH: Image Maker,” a sound installation called “The Murder of Crows,” “Storm Room” in the RBC New Works Gallery, “BMO World of Creativity” (children’s gallery), and a few industrial photographs of the construction of the new building by Edward Burtynsky. Visitors were taken through the galleries with curators explaining the works, then by volunteers helping to direct the crowds. It was well-executed and well-organized for such an occasion, leading to 650 new memberships adding to an all-time high of 2,250 annual memberships at the time. Art is often a catalyst for change. Especially in post-modernist art, the unconventional methods and out-of-the-box ideas spin-off into new ways of looking at existing structures and agencies. If there was a single building in the city which has changed Edmonton downtown, it would be Stout’s Art Gallery of Alberta. This four-storey sculpture has changed Edmonton’s skyline is iconic beyond its architecture of a stainless-steel river running through the grass grid, or its metallic-lustre northern lights upon the monotonous zinc walls of daily life. Luppino and the board members who chose this building showed Edmonton that we can do better. The day the Art Gallery of Alberta opened was the day Mandel’s mandate for the city to have “no more crap” architecture became a reality, and we grew to expect more. Edmontonians can all be thankful for this legacy.